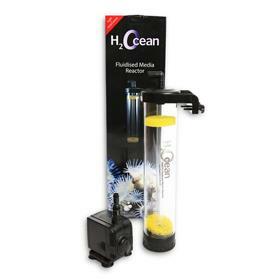 D-D The Aquarium Solution has a new reactor kit being released under their H2Ocean line. Called the FMR75, this new fluidized media reactor comes as a complete kit with a 1500 l/h feed pump, clear plastic tubing, a flow adjustment valve, media sponges, cable ties to secure the tubing, and even a check valve. The FMR75 is suitable for all types of aquarium media, and given the fact that there’s a flow adjusting valve, hobbyists can even use media that isn’t designed to tumbled, such as GFO. To keep the reactor adaptable to many different setups, D-D has given the FMR75 the ability to stand in or beside a sump, as well as hang on the side of one. The inlet and outlet plumbing can be fitted in many different positions to point each in different directions if need be. Additionally, this reactor is designed to prevent dead spots in the media and keep the media in the reactor. When typical media reactors are first started, they often send the media shooting upward into the chamber causing some to be expelled into the sump. The FMR75 prevents this by using a perforated plate and an extra foam pad to keep the media in the reactor. The retail price on the FMR75 comes in at $115 and is currently available to purchase.